A.W. Mercer offers 24/7 full service sheet metal manufacturing and fabrication. As a custom sheet metal manufacturer and fabricator, we also offer our customers a variety of welding services. With over 13 AWS certified welders, our employees can fabricate some of the most complex welded fabrications. Our facility has state of the art equipment that gives us great flexibility to provide our customers with precision manufactured and fabricated parts. Our lot sizes typically range from 5 to 500 pieces. Programmable accuracy in increments as small as 0.001"
Mild Steel from 14 to 22 Ga. Stainless Steel from 16 to 24 Ga.
Aluminum from .030 to 1/8"
A.W. 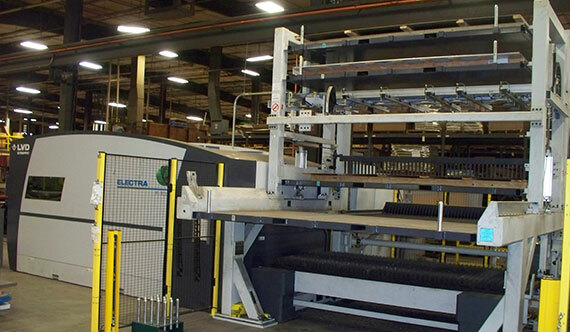 Mercer also has a large inventory of conventional sheet metal manufacturing and fabrication equipment. This extensive list can be found on our Equipment List. We also carry a wide array of tooling for embossments, louvers, integrated hinges and a large selection of standard tooling to form a variety of bends and radius. A.M Mercer is capable of manufacturing items from a variety of metals including cold roll steel, hot rolled steel, stainless steel, aluminized steel, galvanized steel, Galvannealed steel and aluminum. Our commitment to our customers has been to expand our core competencies to meet their needs and to provide ongoing training for all of our employees. With vigorous and ongoing training we continuously evolve to meet our customers ever changing requirements.